- www.kevin-palmer.com - I've been wanting to get an image like for a long time. But it's been several years since we've had a comet this bright. This comet named 46P/Wirtanen was discovered in 1948 and will make it's closest approach to Earth next week. I had my doubts that this picture would happen. 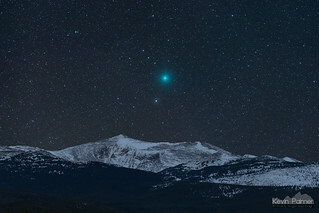 The comet would only be positioned above this snowy mountain for 3 nights at most. Even rarer than a clear night in December, I needed a night with no wind. But at 2AM this morning, everything came together. The temperature hovered around 0°F; it was a frosty nostril kind of night. 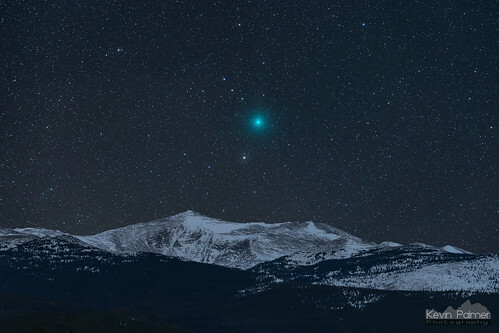 When I first arrived in the Bighorn Mountains the comet was just visible to the naked eye, but the best view was through binoculars. In my pictures, it's about 2-3X the angular size of the moon. To create this image I first shot a 4 panel mosaic of the comet using a Nikon D750 and Nikon 180mm f2.8 lens on an iOptron Skytracker mount. Those shots were 2.5 minutes, f/5, ISO 1000. Then I turned off the tracking and shot a time-lapse of the comet setting to later use for reference so I could position and align the comet exactly as it appeared behind the mountain. After the comet set, I shot 2 15-minute images of the mountain. Then I combined all 6 images as accurately as I could.